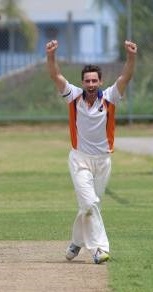 Northern Power skipper, Chris Archer has been a leading performer on the Central Coast and for the Central Coast representative team for many years. The left arm spinner is a leading contender to gain a berth in the NSW Country team after another impressive showing at Inverell last week. Lets find out more about the man they call "Archy"
Funniest thing seen on a cricket field: Greg Mathews arriving in a taxi wearing his circuit gear for a Sydney First Grade semi-final with Stuart Clark about to start the 3rd over of the match. Some pretty entertaining conversations ensued between Mo and his teammates!